Retro themed shooter shows why the action was better before the millenium. Far Cry 3 Blood Dragon is the most refreshing and oddball game to come out in recent memory. The game can be best described as a fusion of 2003’s Tron 2.0 game by Monolith Productions with the design aesthetics of games such as 1989’s Zerowing, famous for the “All your base are belong to us” Internet meme. Throw in a story and characters that would not be out of place in a Chuck Norris movie and then you will have Far Cry 3 Blood Dragon. 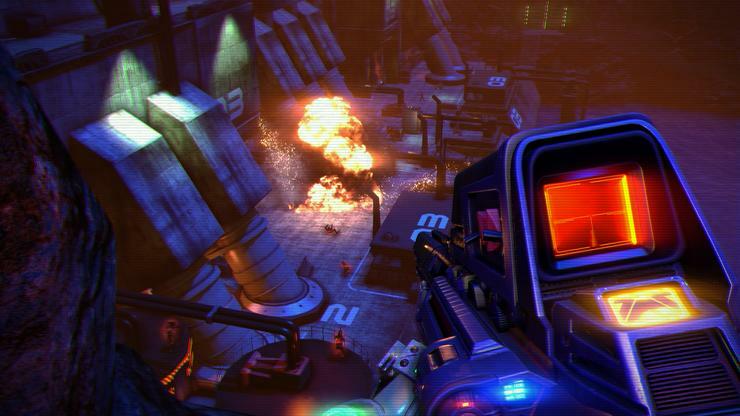 Ubisoft creative director, Dean Evans, explains why the game turned out the way it did..
What is Far Cry 3 Blood Dragon? Ubisoft creative director, Dean Evans (DE): Far Cry 3 Blood Dragon is an all-out honest cyber shooter that doesn’t take itself too seriously. In a genre saturated with super serious narrative and realistic settings, we felt it was time to inject some good old fashioned robofun into it. Think of it as the third movie in an action franchise, where it’s got a bit tired and long in the tooth. It’s that moment when the producers decide to go all in. Robocop 3 and Rambo 3 are great examples of movies that just went crazy to explode or implode the franchise. Toys, cartoons, cereal, that kind of stuff came flooding in. The philosophy with Blood Dragon was to create something that’s so bad it’s good. Many shooters are just 80s action movies in disguise, so we just embraced it and ran with it. Can you tell us about the vision behind the game? DE: Blood Dragon is the product on growing up in the 80s and 90s, late nights watching action movies and playing first and second gen consoles, and a single light from the TV illuminating the room while burning your retina. It’s a time when browsing the video store was the highlight of your week. VHS forever, baby. I miss the aesthetic of those times. Chrome, lasers, cyborgs, neon and smoke. And when I talked about it with the team, I realised I was not alone and they happily joined the cyber-ranks. It’s a timeless aesthetic that unfortunately has almost disappeared from gaming. There was a time when it ruled the world and I say bring it back. It was the birth of our industry and deserves to be celebrated. How did you write the script? DE: We sometimes used pens but mainly a BBC Acorn computer using word processing software. What can you tell us of the scope of the game? DE: The game has about eight hours of content and infinite open world filled with cyber murder. Can you tell us more about the group behind the soundtrack? DE: It’s Power Glove from Melbourne. These guys are the bomb and they deserve huge success. This is their first videogame project and they have delivered beyond all expectations. Available soon, by the way, so keep an eye on our channels. What’s the takeaway when the game ends? Why a standalone experience instead of DLC? DE: We wanted to experiment with different forms of expansion and a standalone was our choice for this project. DE: PlayStation 3, Xbox 360, PC and Turbo MegaSystem. Have you planned any of the leaks on purpose? DE: The creative director has a Welsh lineage and the national vegetable is?